Turns out that coming up with a catchy name for your new TV programme is pretty difficult, as the ex-Top Gear team have discovered. A new clip, released by Amazon Video to promote their upcoming car programme, shows Hammond, May and of course Clarkson trying to come up with a name for their new show after leaving the Beeb and the Top Gear brand behind. As fan’s of the show would expect the three bumbling presenters all have their own ideas on what to call the show, it just so happens that they’re all rubbish. Clarkson’s idea’s, Selling England By The Pound and Watcher of the Skies are immediately shot down by his co-presenters, of course, for being the titles of Genesis Albums. The buffoonish Clarkson doesn’t let this get him down though, and regroups with the worst suggestion ever, A Small Puddle of Excellence. While Hammond’s , frankly genius, idea of ‘Auto-mates‘ is rejected almost as soon as he says it aloud. 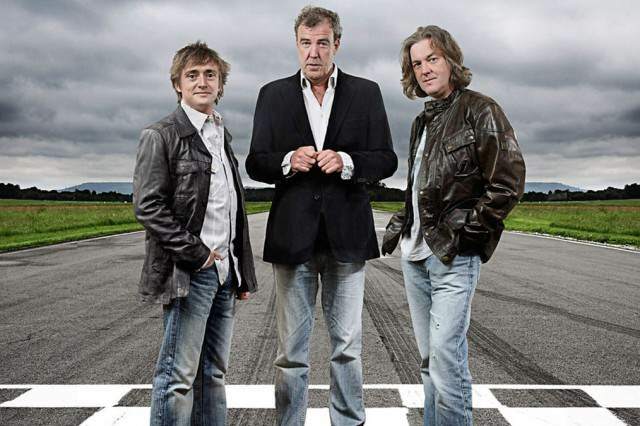 Best of all though, and by far the catchiest, is May’s idea, The Clarkson, Hammond and May Car Show on Amazon‘ which is unfairly dismissed as too long.